An instance of RPC-082. Taken █/██/199█. Containment Protocols: All RPC-082 specimens are to be kept within standard humanoid containment chambers located within Site-37. Under no circumstances are two or more RPC-082 specimens to come into contact with each other. RPC-082 specimens are to be constantly monitored via security cameras, and any changes in behavior are to be reported to Head Researcher Camden (see Document 082-01). A minimum of one Authority Security agent is to be present and equipped with 160-volt electric stun rod at each containment chamber entrance at all times. Any reports of uncontained specimens must be immediately investigated by Authority Security Team 'Tyrann'. All discovered instances of RPC-082-1 are to be immediately destroyed. Currently, there are 18 27 known RPC-082 specimens held in containment. Description: RPC-082 is an anomalous species mimicking the appearance of popular children's mascot Barney the Dinosaur, presumably originating from ██████████, Alabama. All RPC-082 specimens vary in appearance and size and are typically bootleg in design. Specimens require no form of hydration, rest, or nutrition to stay alive. Analysis of recovered tissue samples of RPC-082 reveal that specimens are organic, and the seemingly plastic exterior of RPC-082 specimens is muscle tissue. Further analysis revealed that seams connecting parts of specimens' 'skin' is held together by a species of unidentified microorganisms found in the saliva of RPC-082 specimens. Specimens are shown to be highly vulnerable to electricity and will attempt to flee if exposed to an electric current. RPC-082 specimens terminate upon being exposed to a current with a voltage of 200 or higher. RPC-082 specimens are predatory, and exclusively hunt adolescent humans between the ages of 5 and 14. The choice of prey is seemingly random. Specimens have shown to be hostile and highly violent towards humans over the age of 14. Between the hours of 7:00 AM and 8:00 PM, specimens will begin to hunt for adolescent humans. After 8:00 PM, specimens will return to a 'hive' (see Addendum 082-3), hereby referred to as RPC-082-1, and 'hibernate'. If a specimen successfully apprehends a target, the specimen will proceed to strangle the subject. Specimens have an apparent knowledge of the exact moment victims fall unconscious, and will proceed to transport them to instances of RPC-082-1. Upon arrival to an instance of RPC-082-1, the victim will be restrained via a thick and web-like substance originating from the █████ of each specimen. Through unknown means, victims will be impregnated with an 'egg'. After █ hours, a new specimen will emerge, [DATA EXPUNGED] the victim in the process. Currently, ██ RPC-082-1 instances have been destroyed by Authority Security Team 'Tyrann'. Addendum 082-1: Between the hours of 7:00 AM and 8:00 PM, RPC-082 specimens typically stand behind the containment chamber door in a predatory stance. Nocturnal activities involve attacking and attempting to break the containment chamber door in an attempt to breach containment. This will resume until the specimen resumes predatory activities. 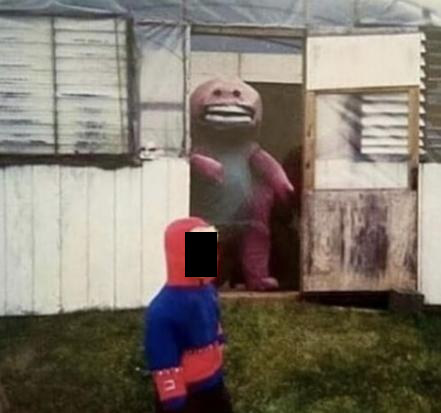 RPC-082 came to Authority attention after reported sightings of strange people in creepy Barney costumes stalking children and approximately ██ missing person cases were filed in ██████████, Alabama, with the last known location of missing persons being in the approximate area of RPC-082 sightings. Upon capturing a specimen, all interrogation attempts resulted in failure. █ specimens broke temporary containment (resulting in █ personnel injuries and █ deaths), and proceeded to return to an instance of RPC-082-1. All escaped specimens were followed and captured along with █ other discovered specimens. Addendum Document 082-3: Instances of RPC-082-1 are typically located in dark and quiet areas, such as abandoned buildings or caves. Instances of RPC-082-1 are typically guarded by a minimum 3 and maximum of 10 specimens. Impregnated humans are typically located behind mounds of the ███████ of previous victims. Head Researcher Camden notes: I want all of those disgusting hives to be destroyed immediately. Destroy them with fire if you have to. Authority Security personnel are free to seek amnestics and reassignment if necessary. I bet those so-called therapist vultures at Sector-12 are having a field day right now.